The ambiance was much as I remembered, except there were a lot of somewhat obnoxious Google employees at a big table near the entrance. It was still family friendly, and welcoming. The service was, just as we remembered it, super slow. The location really is quite nice, with the brewery showcased behind glass walls, in close proximity to the kitchen, and a very open feeling to the whole place. But of course Tied House are all about the beer, so I did a 6-piece sample paddle. They give you 6-ounce glasses, which is way too much, but you get what you get. 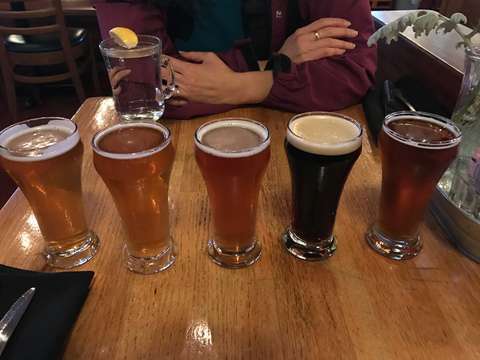 At first, the server thought they were out of the pale ale, so the picture below does not include that one; later he discovered they had some, so brought me one. Apparently Hermitage is their expansion brewery, where they do more experimental stuff, and also where they brew most of their IPAs. Not sure why they needed a separate brewery brand for that. In days gone by, Tied House tended more towards the malty, rather than the hoppy, so I suspect it was essentially a difference of opinion or approach that led to having two breweries. I think I get that, as over-hopping can often be a way to hide lack of malt complexity, so IPAs and stronger-hopped brews can be seen as a cop-out, even though I know personally that a good IPA can be quite challenging to brew. But this is all speculation, and from a consumer's perspective, it's just confusing. There would be no harm in branding the IPAs as Tied House, even if they are not brewed on-site (as long as this is explained on the menu). Overall, it was a mixed experience, with some highs and some lows. The Cascade Amber was a very drinkable, approachable beer, and I recall it being my favourite from tied House long ago; I would not hesitate to recommend this brew to anyone going to Tied House.